I know my mom's been wanting to see photos, but anyone else is welcome to look as well. My color theme this year was purple, blue, and yellow/gold, so stronger colors than last year. 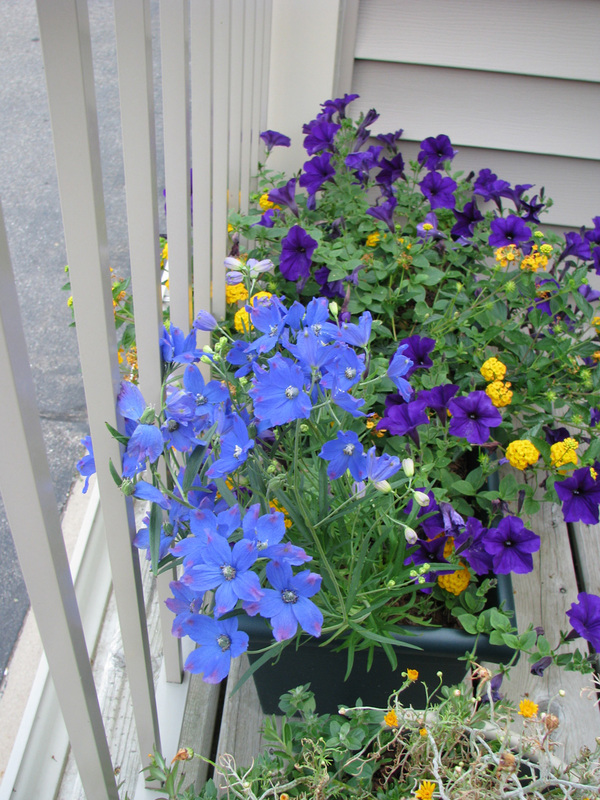 I kept some of the plants that did well last year (petunias, calibrachoa, lobelia, bachelor's buttons) and tried some new ones as well. 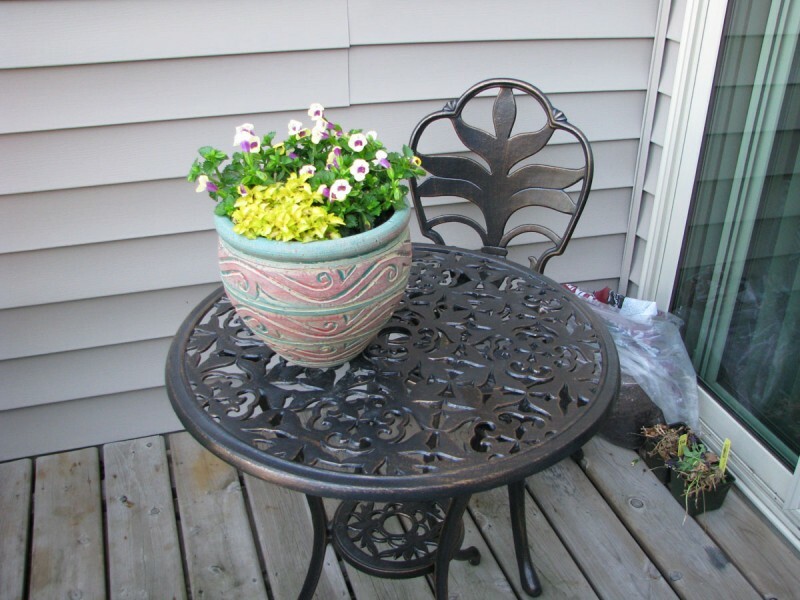 Got myself a small bistro table, and as it's on a shadier part of the deck, I decided to try some torenia (clownflower) and coleus. I think they want more sun, but the torenia has started doing better once I moved the table a foot farther from the door. 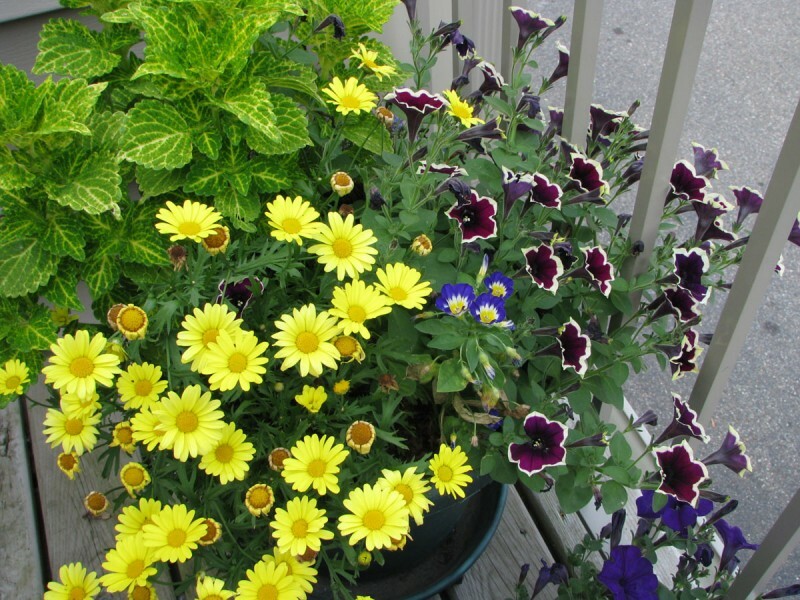 My big pot this year contains 'Electric Lime' fancy coleus, with 'Rim Magenta' petunia, 'Butterfly' Marguerite daisy, and 'Blue Ensign' dwarf morning glory, as well as some lobelia that has nearly been buried. 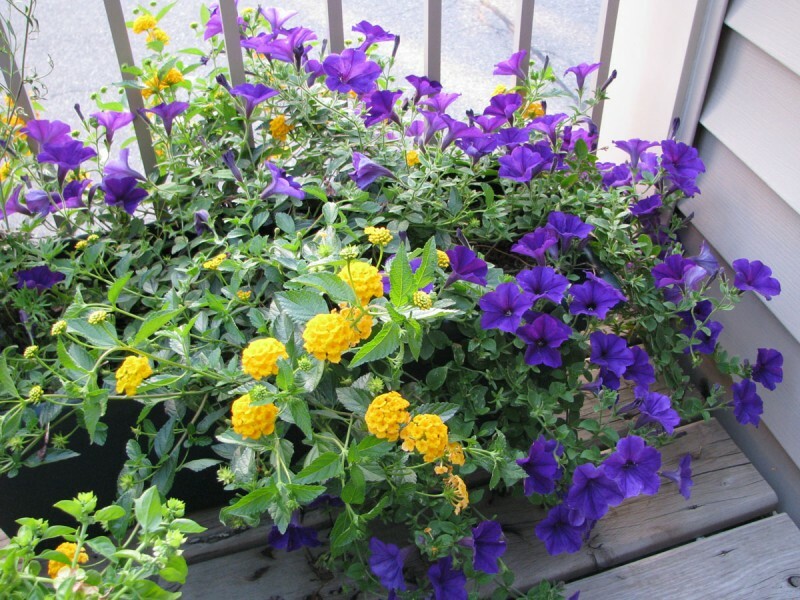 The Marguerite daisy has stopped blooming at present, and the dwarf morning glory does not appreciate rubbing elbows with so many neighbors, but the coleus and fancy petunia are doing fantastic. 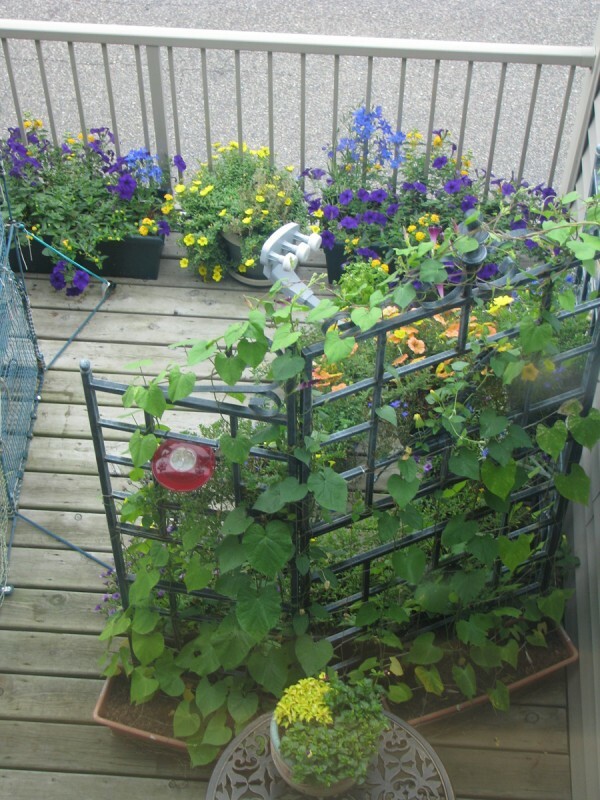 Here's a view of the trellis area. 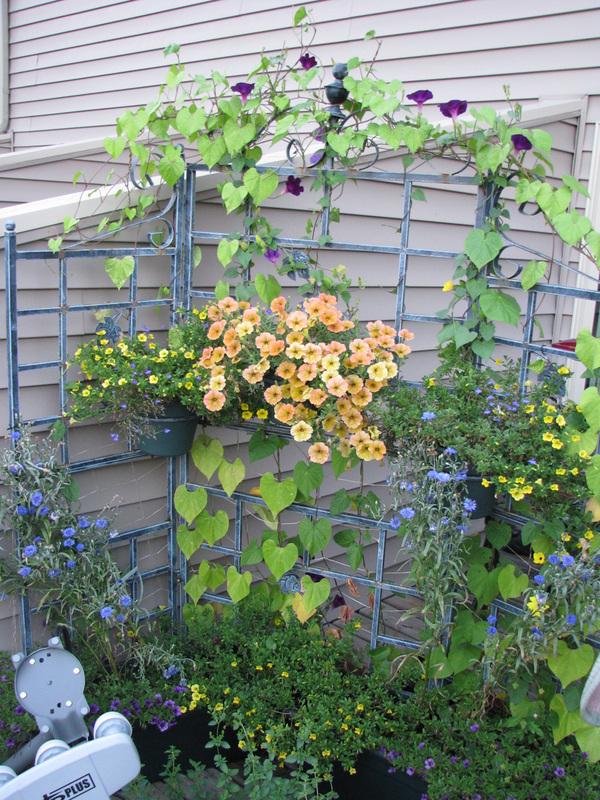 Climbing on the trellis this year are a black-eyed susan vine, 'Grandpa Ott' morning glories and 'Heavenly Blue' morning glories. The yellow and purple calibrachoas are doing a little better now after protesting their lack of pampering while I was gone. 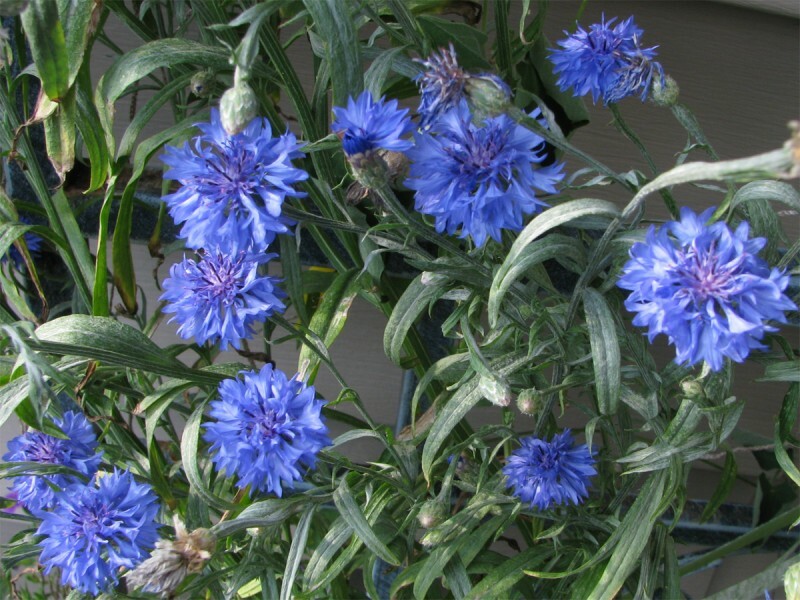 The bachelor's buttons and 'Regatta Marine' lobelia provide some blue. In the center pot is a neat Cascadias 'Indian Summer' petunia that rather breaks my color theme but I'm quite enjoying. I'm really pleased by how well these 'Easy Wave Blue' Petunias and 'New Gold' lantanas are playing together in my front planters. The lantana have been holding their own against the petunias, which is saying something, since wave petunias are mad growers. I thought wave petunias were hot for world dominion, but the prize this year must go to my purslane, which unfortunately starts blooming after I leave for work and stops before I get home. Still, this photo shows how it has buried its pot. It slaughtered a 'Solar Fire' Ursinia and then romped over its carcass, and would have buried my unhappy evovulus three times over if I didn't keep pinching it back (but hasn't killed its roots yet, thankfully). I love purslane, but I have a slightly different perspective now after living with this one! 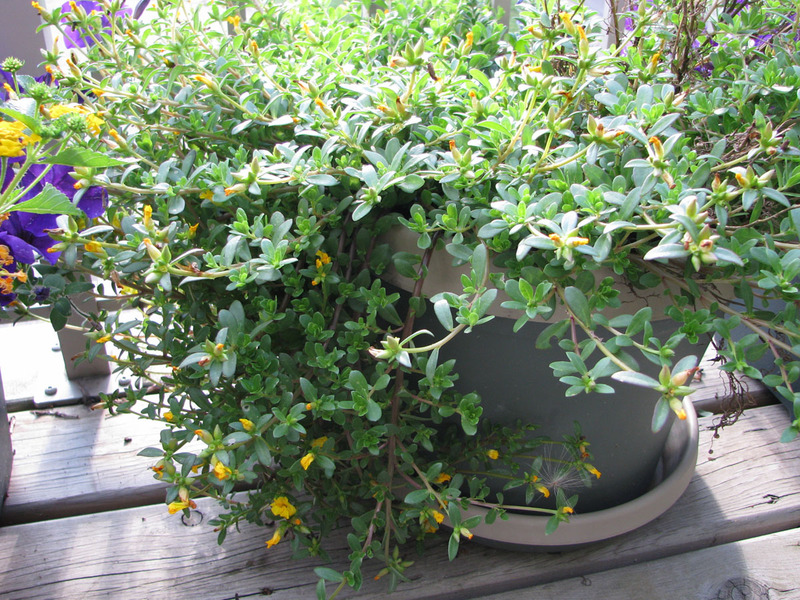 The cheerful yellow flowers of that homicidal purslane can be seen in this view from the window of the cat room, since I took this photo on a weekend. so wonderful. 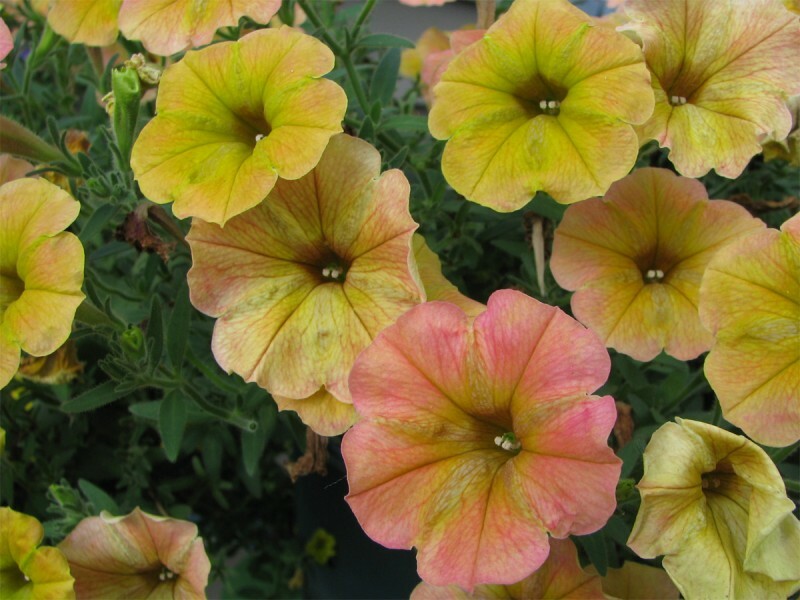 You are sure having a good summer for your flower garden. I really like your color choices. so enjoyed seeing all the photos. They've been talking about how this has been a fabulously "perfect" summer (so far). 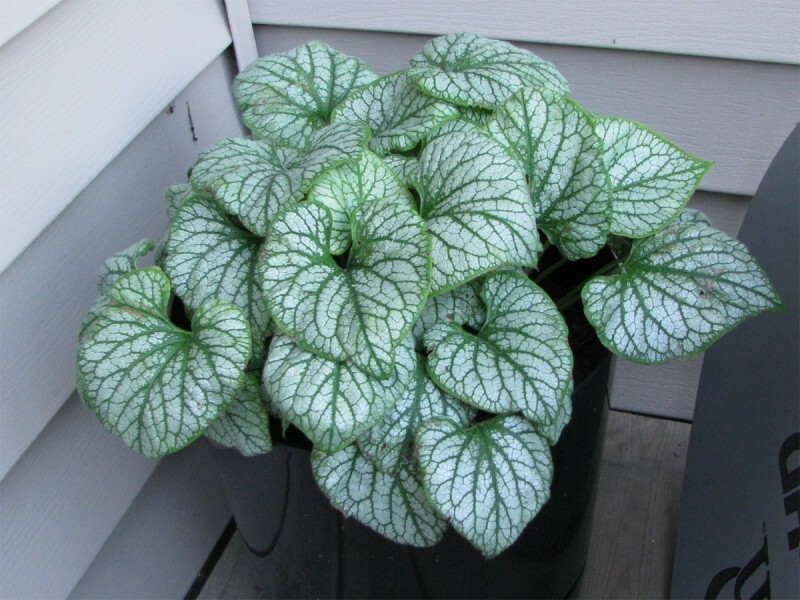 It has certainly been a stellar one for growing things!